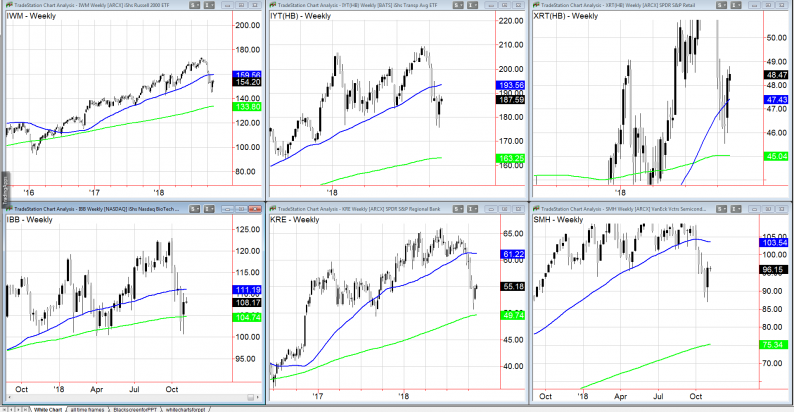 Here are the weekly charts of the Modern Family. From top left-The Russell 2000 IWM, Transportation IYT, Retail XRT. From bottom left-Biotechnology IBB, Regional Banks KRE, Semiconductors SMH. Putting aside the midterm election, Fed minutes out Thursday and any other piece of news currently hitting the tape – What do these pictures tell us? That seasonals favor Retail, but with the rest of the Family in warning, unless IYT saves the day, the market remains under pressure.